Located in Northern Baltimore County, Castanea is a new luxury home community. This 230-acre gated community will feature forty home sites, each on three to five acre plots. The new neighborhood is specially designed to take advantage of the area’s natural beauty. Castanea was developed by Baltmore-based, Cignal Corp. This company has been responsible for the development of many of Baltimore’s premier communities. Cignal Corp. is dedicated to building high quality communities that meet Baltimore’s diverse housing needs. This dedication is apparent in Castanea. 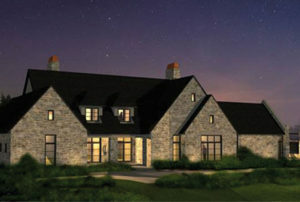 Custom built estate homes at Castanea will include some of today’s most sought after features. The neighborhood will include a number of high-end amenities. The luxury estate community is located in an extremely desirable area on the former site of the Chestnut Ridge Country Club. Castanea is expected to be the most elegant community that Baltimore has ever seen. As Baltimore’s newest choice in luxury living, Castanea features prestigious lots located on over three acres of gorgeous rolling hills. Residents can take advantage of large properties and complete privacy. For added security, the community includes a gatehouse that will be manned 24 hours a day. Castanea will include several waterfront properties. Due to its prime location and luxurious features, homes in Castanea are expected to sell extremely fast. The community’s name, which is the Latin word for chestnut, pays homage to the site’s original name as well as the beauty of the area. The Chestnut Ridge Country Club was considered a place for rest, relaxation and recreation. Castanea will honor this spirit with its gorgeous views of Greenspring Valley and its state-of-the-art amenities. The community offers convenient access to I-83 and the Baltimore Beltway. Its location makes Castanea the perfect place for anyone looking to work and play close to home. Prime Building Advantage is pleased to be directing the sales and marketing efforts of Castanea. Properties in this luxurious community are available now for immediate purchase. Please contact us if you are interested in owning one of these gorgeous estate homes.